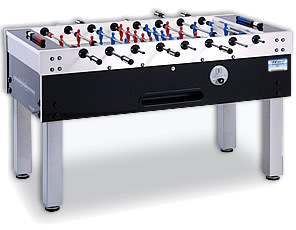 Since 1954 Garlando has been manufacturing and marketing high quality football tables, billiard- tables, tennis tables and air hockeys, meant for the most demanding customers. Garlando products are created through an original synergy between the traditional handicraft and the most advanced technologies, fruit of years of research, to offer a pleasant, safe and lasting use. Working on two different markets – the coin operated games (to install in arcades, pubs, bars) and the articles for the private consumers (families and institutions), Garlando is able to exploit the experiences gained in each sector to benefit the other. The products manufactured for the private consumers in fact have professional features which make them very different from the toy tables, compared to which they boast much better performances both from the point of view of the fun they offer and the duration. Likewise, the articles meant for the exploitation have the same safety features and aesthetic qualities than the home tables. The continuous innovations of our R&D department, the care for the details, the Customer service are the criteria pervading the Garlando work, the reasons which made the company a world leader in its sector, a brand meaning quality and reliability, as also demonstrated by the numerous patents registered. The growing awareness of the impact of the industrial processes on society and environment has recently brought the company to give a particular attention to the Corporate Social Responsibility. In the latest years Garlando has acquired important Certifications such as the ISO 14001 on Environment and the CE mark for Toy Safety.